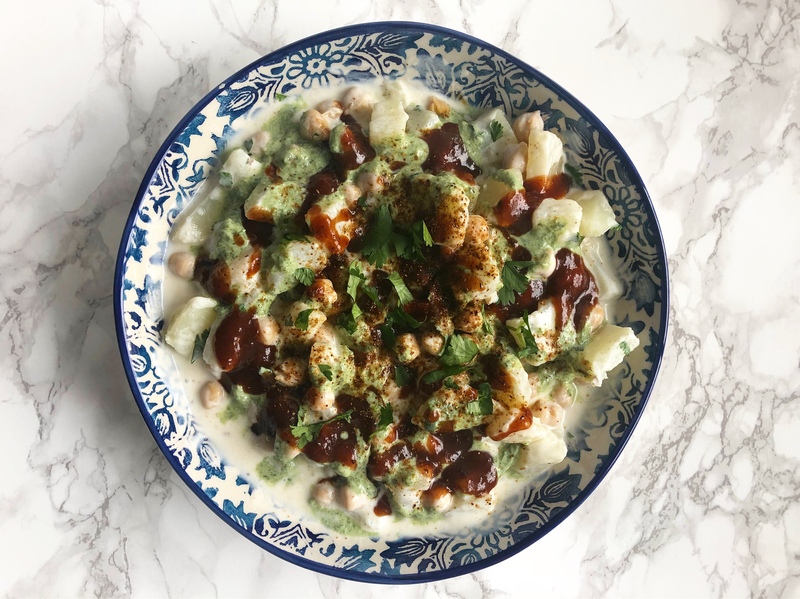 Cold potatoes and chickpeas drenched in imlee (tamarind) and yogurt, with onions and fresh coriander peeking through. You take a bite and hear that satisfying crunch from the pappar (super thin, fried bread) and get a punch from the chaat masala and you know you’re home, because home isn’t where you live, it’s where the papri chaat is. That’s how I feel everytime I eat a well made plate of papri chaat. Don’t ever accept soggy and dry papri chaat, you’re better than that. Follow these easy steps and you’ll never have to deal with a badly made plate of papri chaat again. I must add that if you want it to taste good, make your own chutneys. I’ve posted recipes on snapchat (famarana) in the past few days, and i’ll jot them down here as well! Place the potatoes, chickpeas, onions and fresh coriander/cilantro in a bowl. Mix the Mint Chutney into the yogurt, add salt if needed, and 2-3 Tblspns water or milk to make it less thick. Pour the yogurt mix onto the ingredients in the bowl. Don’t mix. Do the same with the imlee ki chutney, pour over, don’t mix. Then sprinkle over the cumin and some chaat masala. The more chaat masala, the more spicy so use as much as you can handle. Cover and refrigerate. Add the pappar right before serving or they’ll become soggy, or you can just serve them in a separate bowl. Bring the water and tamarind paste to a boil in a saucepan and let it simmer for 10 minutes. Strain to get the seeds out. Even if the pack says seedless, it never is, so strain strain strain! If there’s still some pulp left on the seeds boil them again in 2 cups water and strain. Then pour the liquid back into the saucepan and add the sugar, red chilli powder and cumin. Start with 1/2 cup sugar and taste, if you think it needs more sugar then add some more. Cook the liquid for a few more minutes until it thickens a bit. Then cool it completely and pour into an airtight jar and refrigerate.